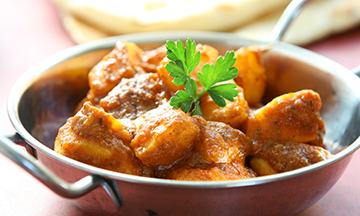 We offer day-fresh cuisines from the East India, Bangladesh & Pakistan plus European Dishes & Desserts, we provide arguable the best curry's in Bexhill On Sea being packed with authentic taste and offering incredible value for your hard earned money. Tajmahal is an unlicensed restaurant, guests are welcome to bring their own favorite beers or bottle of wine to enjoy with their meal. A great opportunity to choose exactly what you want to drink without paying a restaurant mark up or a corkage charge! 2 Papadum, 1 x Chicken Tikka, Onion Bhaji, Green Salad, Mint Sauce, Bombay Potato, Chicken Tikka Masala, Lamb Korahi, Nan, Pilau Rice. 4 Papadum, 2 Chicken Tikka, 2 Onion Bhaji, 2 Green Salad, 2 Mint Sauce, 2 Onion Salad, Chicken Tikka Masala, Lamb Karahi, Garlic Chilli Chicken Masala, Chicken Korma, Vegetable Bhuna, Bombay Potato, Sag Aloo, 2 Nan, 4 Pilau Rice.